The Flavian Amphitheater, more commonly known simply as The Colosseum, is located in the center of Rome, Italy and is the largest amphitheater ever built. It is difficult to go to Rome and not see the Colosseum it is so large. Constructed of concrete and sand under the emperor Vespasian, it took only eight years to complete (72-80 AD). The three emperors responsible for the construction and modifications between 72-96 AD were Vespasian, Titus, and Domitian; they were collectively known as the Flavian dynasty and it for them that the amphitheater gained its Latin name. Originally used for gladiatorial contests, animal hunts, executions, and other public entertainment, the Colosseum had an estimated capacity of 50,000-80,000. This large range is partially based on the type of entertainment that was happening at the time as the mock sea battles took up a little more space than a drama based on classical mythology. In the early medieval period the building was no longer used for entertaining the masses, but continued in its life as a site for housing, workshops, and a quarry. Standing as a symbol of Imperial Rome and all its glory, the Colosseum does not look the same as it once did. 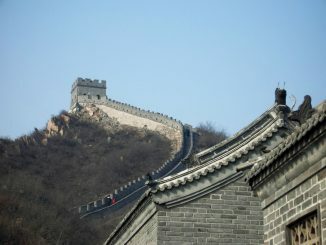 After suffering damage from earthquakes and pillaging from robbers in need of stone, much of the original structure was slowly removed over hundreds of years. The area where the Colosseum sits was a busy and densely populated part of the city of Rome in the 2nd century BC but was decimated by the Great Fire of Rome in 64 AD. Nero took the opportunity after the fire to seize the area to add to his vast personal domain and because the site was large and flat, it was the perfect location for a grand tribute to the greatness of Nero. In what is commonly seen as a populist move, Vespasian decided to build the Colosseum of the site of Nero’s lake, and effectively give the land back to the people. Placing the Colosseum in the city center instead of the outskirts of town made it a part of the beating heart of Rome and a symbol of the move from Nero’s policies to those of Vespasian. With money and spoils taken from the Jewish Temple after the Siege of Jerusalem, and with the newly acquired 100,000 Jewish prisoners, Vespasian started the construction around 70-75 AD. The slaves were required to do the manual labor and work in the travertine quarries at Tivoli as well as transport the stones more than 20 miles to the construction site. 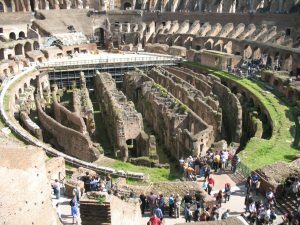 With a large group of “free” unskilled labor to do all the actual hard work, teams of professional Roman engineers, artists, painters, and builders were able to attend to the task of designing and decorating the Colosseum. Construction of the Colosseum had been completed up to the third story by the time of Vespasian’s death in 79. The top level was finished by his son, Titus, and the inaugural games were held in A.D. 80 or 81. Accounts from the inaugural games note that over 9,000 wild animals, many of them from Africa were killed. 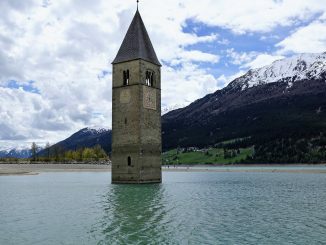 With nearly two-thirds of the original structure being destroyed by natural disasters, weather, neglect, or vandalism, restoration efforts began in the 1990’s and have continued to today. 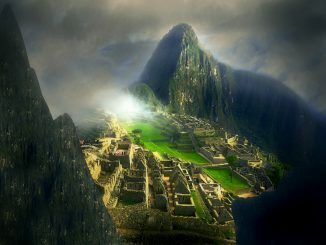 The structure itself is not a World Heritage Site but it is considered one of the New Seven Wonders of the World. The Colosseum today is a major tourist attraction in the middle of a city filled with tourist attractions and an archaeological site. Not only is the Colosseum one of the most popular sites in Rome, it is one of the most popular and recognizable sites the world over. Entrance is free to EU citizens younger than eighteen or older than Sixty-five. Parts of the Colosseum including the façade were used for the construction of St Peter’s Basilica and later monuments. The Colosseum is the most famous tourist attraction of Rome with over a million visitors each year. Something to keep in mind is that Rome gets crazy hot in the summer. Take water and don’t be afraid to sit and relax for a while in the middle of the day. Buy a guided tour and you can skip the extremely long lines. You will also get extra information that might just make it worth the ticket price alone. 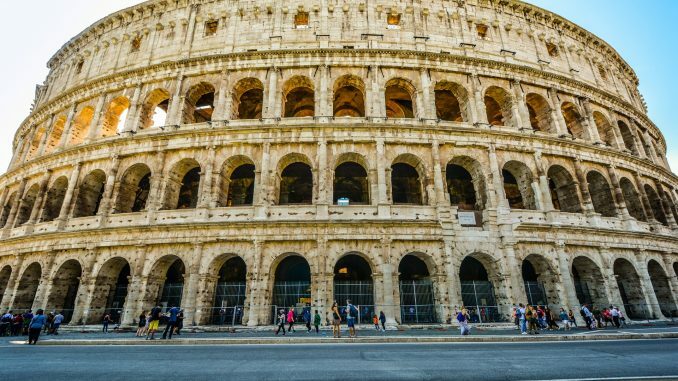 Buy tickets to see the Colosseum in advance. Tickets are available online as well. Get there early. The Colosseum opens its doors at 8:30 and lines start to form at ten till. If you plan on spending a few days in Rome get the Roma Pass. It covers many of the museums as well and can actually save you a bit of money. Almost everything is paved but very uneven after hundreds of years of foot traffic. Take good footwear if you’re walking around.